08:00 Pick up at Hoi An or Da Nang Hotel , start My Son Holy Land Tour. √ In My Son Holy Land, the towers and temples have been dated from II century to XIV century, but archaeological found out and showed us that the Cham kings were buried here since IV century. The total of buildings are more than 70 towers including small, normal and large towers. 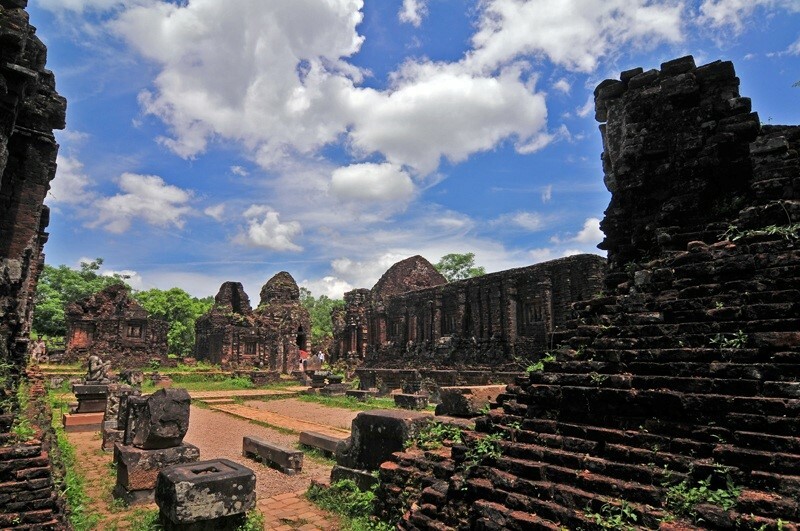 My Son Sanctuary supposedly is the religion center and culture of the Champa Ancient Kingdom. √ Most of the buildings were built by wood, but they had been destroyed since the 6th century in fires. In the 7th century, My Son was restored by Sambhuvarman who rebuilt the temples with special bricks which have existed until now. Up to the 13th century, more than 70 similar temples had been built, establishing My Son as a sanctuary of Hinduism in the Champa Kingdom. Although scientists have been conducting researches for many years, they still do not know the secret of how to make those bricks and build those towers. 10:30 Watch the Apsara dance performance of beautiful ladies. 11:30 Free shopping and visit the exhibition rooms to see the pictures and its description of Cham People and their structure. 14:30 End of Tour Program, transfer you back to the hotel. √ Children under 5 years old: FOC. √ Children from 5 – 9 years old: 50% of the fare.